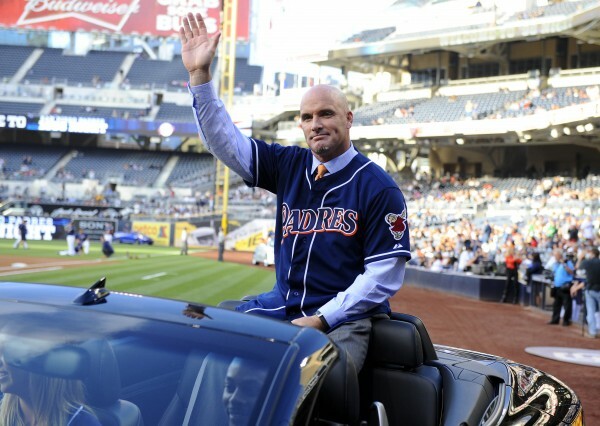 Former San Diego Padre Mark Sweeney waves to the crowd during a pregame ceremony to honor the members of the 1998 National League Championship team before a game against the Arizona Diamondbacks at Petco Park on June 14, 2013. ORONO, Maine — Mark Sweeney had a profound impact on the University of Maine baseball program. From 1988 to 1991, the native of Holliston, Mass., was instrumental in leading coach John Winkin’s Black Bears to 195 victories and two NCAA regional appearances. Sweeney, a power-hitting outfielder, twice earned All-America honors, including a first-team nod as a senior. This weekend, the former major leaguer returns to his old stomping grounds on the Orono campus, where he will have his No. 12 jersey retired by UMaine. Sweeney will be honored during halftime of Saturday’s football game between the Black Bears and William & Mary at Alfond Stadium. “The numbers that he put up at the University of Maine are second to none,” said UMaine baseball head coach Steve Trimper, who pointed out Sweeney still owns 20 school records 22 years after he closed out his collegiate career. Sweeney is in a select group of UMaine baseball players and coaches whose jerseys have been retired. He joins Mike Bordick (3), Dr. John Winkin (5), Bill Swift (8) and Jack Butterfield (21) as the only Black Bears to be so recognized. Most recently, Sweeney ha s served as a pregame and postgame studio analyst for San Diego Padres TV game broadcasts on Fox San Diego. He previously spent three years working in the Los Angeles Dodgers organization. Sweeney holds UMaine career records for games played (238), at-bats (857), runs (240), hits (328), doubles (66), home runs (52), runs batted in (211), total bases (568), slugging percentage (.663) and extra base hits (127). He held the stolen bases record with 69 until last season, when it was broken by Mike Fransoso. Sweeney also lays claim to Black Bear single-season marks for runs (77), walks (54), doubles (22), home runs (23), RBI (80), total bases (178) and extra base hits (39). He also holds the school record for runs in a game (6), home runs in an inning (2) and consecutive hits (11). Sweeney, who was a Freshman All-American in 1988, joins Rick Bernardo and Andy Hartung as the only first-team All-Americans and is accompanied by Swift as a multiyear selection. He was the North Atlantic Conference Player of the Year in 1991. He was inducted into the University of Maine Sports Hall of Fame in 1996. Sweeney, who was recruited by UMaine as a football player and competed for one season, was a ninth-round draft pick of the California Angels in 1991. He enjoyed a 14-year big-league career with St. Louis, San Diego, Cincinnati, Milwaukee, Colorado, San Francisco and the Los Angeles Dodgers. Sweeney ranks second all-time in baseball history with 175 career pinch hits and is tops all-time with 102 career pinch-hit RBIs. UMaine’s baseball alumni will gather as part of the homecoming weekend festivities. Former players were scheduled to get together Friday evening for a meal in Palmer Lounge after the Black Bears closed out the fall season with a final practice session at Mahaney Diamond. UMaine has scheduled an alumni game for 9:30 a.m. on Saturday. Former UMaine baseball assistant coaches Billy Cather and Ryan Forrest have taken the next step in their respective careers. Cather has been hired as the head coach at Lesley University in Cambridge, Mass., while Forrest has hooked on as an assistant at Millersville (Pa.) University. Cather landed his first heading coaching position in September after spending four seasons on Trimper’s UMaine staff. Lesley is a Division III program that competes in the New England Collegiate Conference. Cather was a full-time assistant at UMaine from 2011 to 2013, working with the hitters and outfielders. He previously spent two seasons as a volunteer. He was a four-year starter in the outfield and twice earned all-league honors for the Bears. Cather, a 33rd-round draft pick of Washington in 2008, finished with a career .323 batting average. Forrest was a volunteer assistant for two seasons at UMaine. As a player, the right-handed pitcher appeared in 31 games from 2007 to 2009. At Millersville, he will work with the pitchers and serve as the Marauders’ recruiting coordinator. Forrest earned a B.S. in journalism from UMaine and is working on a master’s in sport management at West Virginia.